I know these guys actually like their hats. This is just a involuntary reaction to having their picture taken. I’ve been slowly planning a multi-color hat for my Dad. I knew that I wanted to use Cascade Eco, but didn’t know how I could collect as many different skeins as colors that I wanted to use. 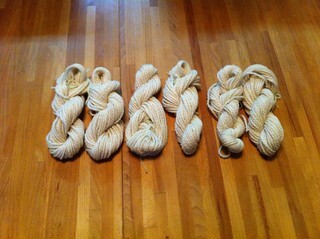 Of course, the solution was to purchase a natural color and dye it! 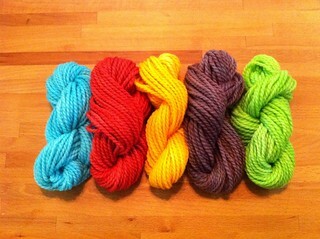 There was still some Kool-aid from when I dyed my first handspun, so I only had to pick up a few extra flavors. I used Knitty’s article as a guide. I loved the look of the ice blue raspberry lemonade and was glad when I found some at my local grocery. Ice blue raspberry lemonade, black cherry, peach mango, grape, lemon lime. These will work great for the project. I think I also need a sixth color, but haven’t found a good choice with enough contrast. I may use white as the last color.